My benchmark onion ring belongs to chef Josh Capon; he very generously gifted it to Chrissy Teigen for use in Cravings, the cookbook I coauthored with Chrissy this year. While there are many secrets to a perfect onion ring, let’s start with the onion itself: I’ve found that firm, oversized Vidalias, or other sweet varieties, stand up best to the thick batter, yet still cook to melting perfection within their crispy casing. In his version, chef Capon pulls out all the stops: cornstarch for powdery crunch, a little leavening agent and not one, but two types of alcohol for a fizzy, flavorful finish. I took that recipe and tweaked it, swapping in potato starch for cornstarch, upping the amount of fizzy beer in lieu of some wine and amping up the spices. 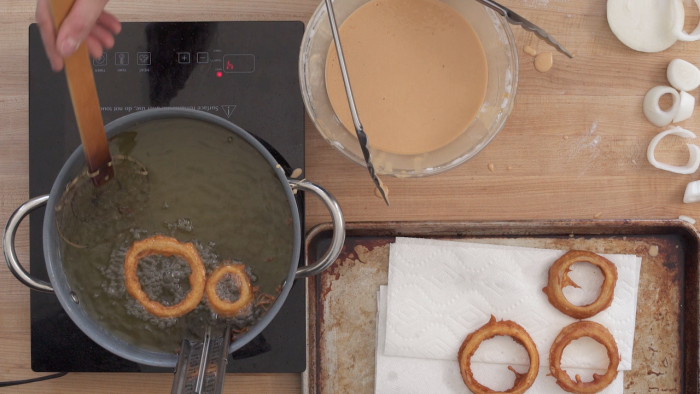 The result is onion rings so good you’ll like them as much at room temperature as you will right out of the fryer. The usual rules of Crispianity apply: Make sure your oil is clean, let it return to temperature between batches, and don’t move your product around in the fryer; let it tread oil and do its thing! Trim off the top and bottom of the onions, carefully peel, and slice the onions into ½-inch discs. (If you’re an obsessive-compulsive type, you can only use the bigger rings, then use the smaller ones for sautéing or something else). Separate the discs into rings and reserve. In a large bowl whisk together the potato starch, flour, baking soda, paprika, smoked paprika, onion powder, cayenne, beer and water. Using tongs or your hands, dip the rings into the batter and add them to the pot a few at a time. Don’t crowd/overfill the pot! These babies need some swimming room so they a.) don't stick together and b.) don’t take that oil temperature down too far. Fry them, flipping halfway through when the underside, 2-3 minutes total. Drain on paper towels and sprinkle with salt and more smoked paprika, if desired.